Air New Zealand is deepening its commitment to Virgin Australia, chipping in to a near half-billion-dollar repair job on the Australian airline's balance sheet. With a 26 per cent stake in Virgin, Air New Zealand is lending Virgin $146.5 million as part of the $476 million package to strengthen the Australian carrier's liquidity while it undergoes a review of its capital structure. Its three other major shareholders - Etihad Airways, Singapore Airlines and Virgin Group - are contributing on a pro-rata basis. Virgin's debt is forecast by analysts at Merrill Lynch to balloon from around A$1.7 billion to more than A$2 billion in the next year. Air New Zealand has invested hundreds of millions in building its stake in Virgin, further building equity in a rights issue more than two years ago and now the loan. Asked whether it could be tapped for more funds, an Air New Zealand spokeswoman said: "This loan provides Virgin with some time [to] undergo a proper review of their capital structure." 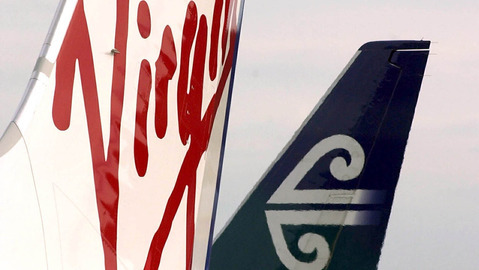 Virgin shares closed up A3c yesterday at A38c, while Air New Zealand shares closed up 3c at $2.87. Virgin chief executive John Borghetti said the review would include an assessment of the best mix of debt and equity capital and initiatives to enhance cash flow and profitability. His airline is emerging from a bruising domestic battle with Qantas and even though it announced a A$71 million turnaround in pre-tax profit analysts have highlighted high debt, slowing momentum and weak operating cash flow. Besides its equity stake, Air NZ has a revenue share alliance giving it access to the Australian domestic market and both airlines the ability to rationalise their transtasman operations. Last month Air New Zealand chief executive Christopher Luxon - a Virgin director - said his airline's strategic rationale for its relationship remained unchanged and he was encouraged by improved profitability. "We have [shareholder support] and the improved performances have been really encouraging."